My darling, it is because of you that my heart has discovered these magical emotions of love, for whenever I look at your smile, you beautify my eyes. Your enchanting grace and charm thrill me with wordless songs, even if all I can hear is the melody of the wind. So simplistic are your feminine ways that my heart grows excited just to watch you bow before a garden of swaying roses. The sparrows gliding across the morning skies even follow your gentle footsteps to a temple for love's worship. Lady Flower, you make my eyes beautiful every time you reveal the mystery of love through your dripping tears. In fact, it is this kind of love that has led me to the fountain of your heart where I shall never be thirsty again. The sparrows gliding across the morning skies even follow your gentle footsteps to a temple for love’s worship. And Jan’s photo is the perfect compliment! Thank you for stopping by. Your words are beautiful and very much appreciated. Thank you so much. I am batting my eyelids! Sooo romantic. Should I be blushing from your batting eyelids (smile)? Thank you for enjoying my humble work with your beautiful eyes. Oh Andy, so beautiful, I teared up again, you always touch my heart. Thank you for the perfect compliment to my photo. The honor was mine to write in harmony with your beautiful photograph. I am very grateful for your affection and friendship. They mean so very much to me (smile). Thank you again. Another of your very beautiful romantic verses. You are unstoppable Andy ! Many thanks for the encouragement and support. Your feedback is always positive. Once again you have thrilled me with your sweetness. Thank you so much for being so kind to this humble poet(smile). oh my gosh! How gorgeous are your words. a song of songs. I am very touched by your sincere kindness. I am also grateful and happy that you enjoyed my humble work. Thank you so much. I finds a different flavor of emotions in your verses. It is so good to see hear from you again (smile). Thank you also for your warm sentiments. I am grateful my dear. I really, really like this one. Your choice of words is superb. The photo complements the poem. Nice combination. I really, really adore the friend in you (smile). Thank you so much for the affection and support. I appreciate each word my dear. Dear friend. It´s a pleasure to visit you and find a poem and all of them bringing peace and dreams to live. Thank you for being so sweet and kind to this humble man. Your words are beautiful...just like your heart (smile). Thank you again. Kisses back to you. Thank you very much. Such tender drama in your words Andy. Its always a pleasure to visit and see what thoughts you will share with us. You are much too kind to my humble heart. Thank you for those lovely remarks. I am thrilled by them. Thank you so much for stopping by and supporting my humble work. I am very grateful. Thank you once again for all the encouragement. It is always good to hear from you sir. Every word inside me is born from love. To share it with you makes it twice as nice (smile). Thank you so much. What beautiful words from your heart to mine (smile). Very well written. In fact, it is most touching. Thank you so much. The melody of the wind...beautiful,Andy! Thank you for your sense of humor. I am always grateful for your feedback my friend. Don't know what to say about the red rose (smile)? In any case, thank you very much for stopping by. Thanks for stopping by. 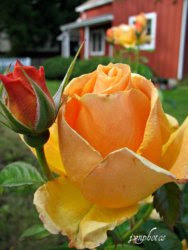 I hope the fragrance of the yellow rose will find your smile. Thank you so much for those lovely remarks. I am most thankful. I like that address, LADY FLOWER ! very heart warming post ! You are also a Lady Flower (smile). Thank you so very much for the warm and kind sentiments. Another beautiful poem, Andy! If all the people in the world were like you there was no Yad Vashem necessary! Thanks for your words. I am humbled and touched by your sweet words of beauty. Thank you so much for those lovely remarks. Beautiful and soft, unlike the previous one which was sensual and passionate...the eyes that can move one from the depths of desire to the gentleness of adoration is beautiful indeed. What beautiful, poetic words from you. I am touched and moved by each one of them. Thank you so much for stopping by. '...the fountain of your heart where I'll never be thirsty again.' Beautiful Andy! Thank you for the lovely sentiments. I am very grateful and thankful for your friendship. Many thanks for your kind remarks. You know I enjoy writing for your beautiful eyes (smile). "You beautify my eyes" sounds so sweet! Thanking you as always for the encouragement and affection. I enjoy hearing from you when you stop by. Your words are as lovely as the rose chosen to represent your thoughts. Your words are also as lovely as the rose I've chosen (smile). Thank you for always being so kind and sweet to this humble poet. Many thanks for your kind words. I hope most grateful for each one. I love your sensual words. Please just leave me the name of the blog next time though as I cannot post comments with links. Thank you for letting me know how I should post my comment next time. Thank you also for the kind words. You are a noble soul! Best regards! Thank you kindly for your warm sentiments. I am grateful. There is such beauty in a smile. Yes, a smile can say so much. Thank you my dear friend for the kind words. How beautiful and sweet you are to me (smile). Thank you for all the encouragement and support my dear friend.